A behind-the-scenes Photo Diary of sorts – A brief look into the making of Episode 1 – Elephant Kingdom and a small thank you to all those who helped make it possible. 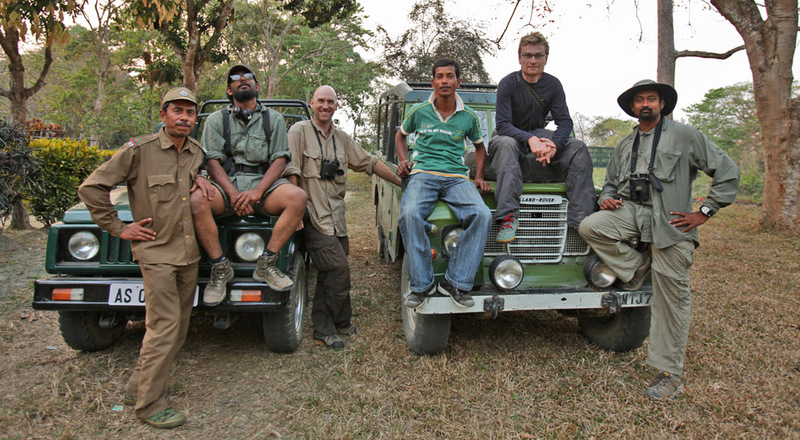 It was late January 2011 when all the stars aligned and I set off to film the first episode Elephant Kingdom for Secrets of Wild India. In Bangalore Chinmay and I hustled to get all the High-Definition cameras ready. My trusty HDX900 was pulled out of its case dusted off and prepared for the long shoot ahead. 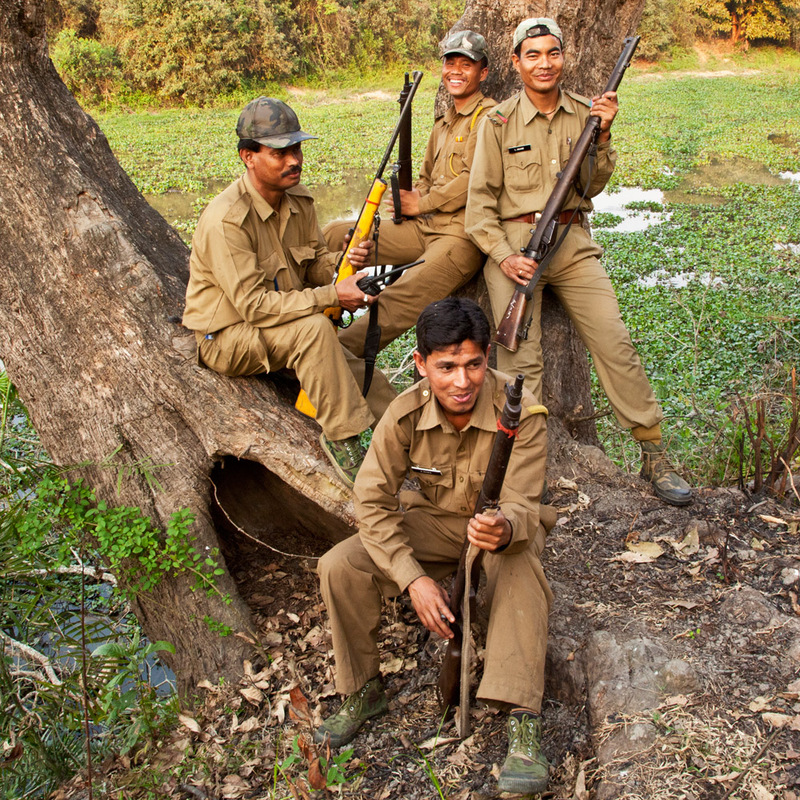 Our first stop – Guwahati – the capital of Assam – A state known more for its tea than for its spectacular wildlife! This is also the gateway to much of North-Eastern India. 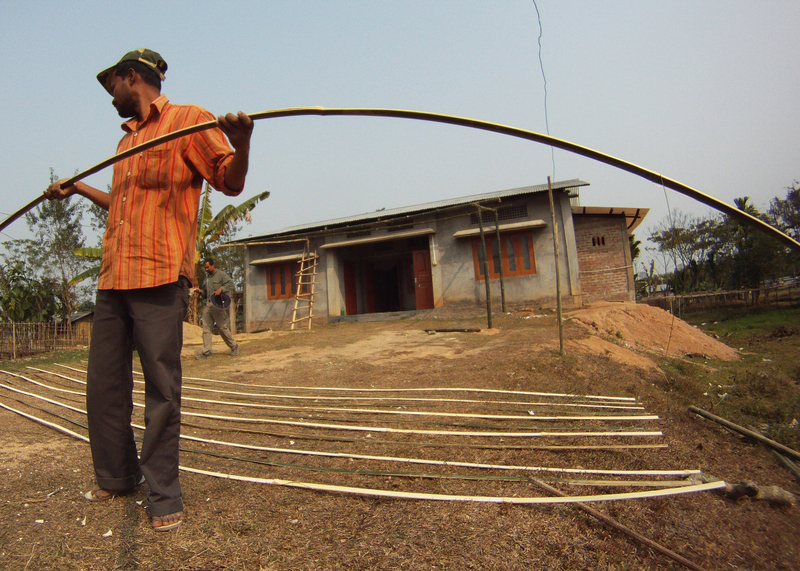 After a few days of permit work and getting the Getaway ready we headed east along the mighty Brahmaputra River. 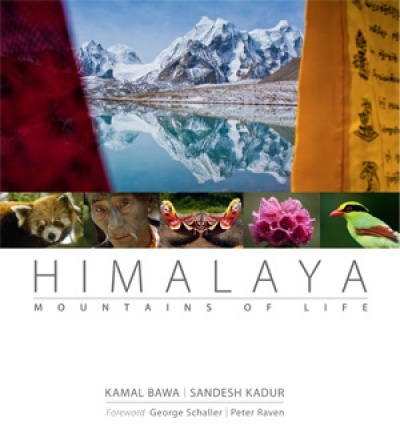 Born in the Himalaya the Brahmaputra is the lifeline and fluid emblem of this part of India. For millennia its waters have shaped the land and the lives of people who live along its broad course. The vast floodplain is rich in minerals and so fertile that little original habitat is left as most of it has been brought under the plough. But one small fragment remains…and that is where we are headed. 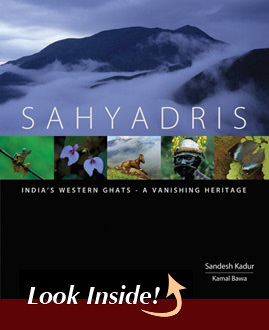 Bordered by the Brahmaputra River to its north and flanked by the Karbi-Anglong hills to the south is a sea of grassland. 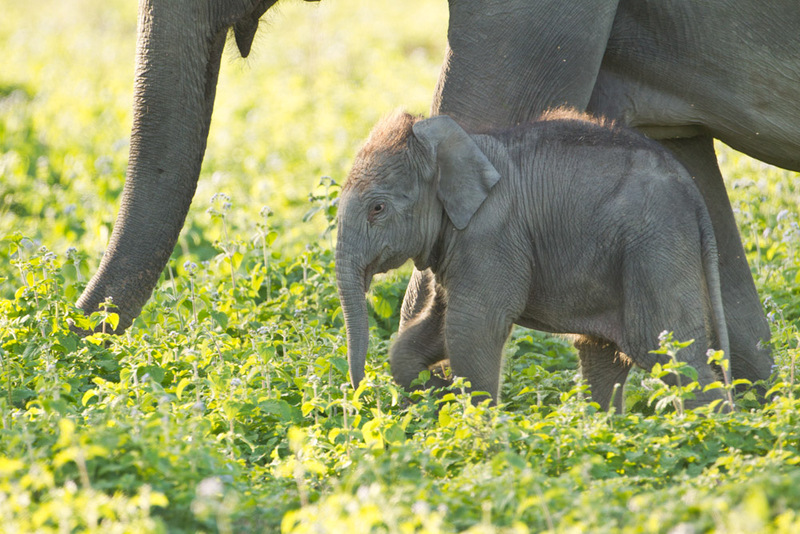 This is Kaziranga – India’s Serengeti – a unique floodplain ecosystem teeming with life. Our first task was to set up a base camp. We found a newly constructed cement house and decided to set up camp there. It had a big hall, resuscitation a kitchen and two rooms with attached bathrooms. 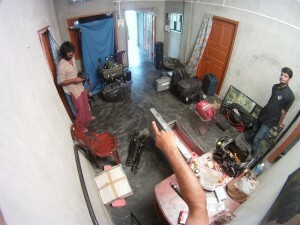 The main hall became the equipment room with a mini-studio on one side. The first order of business was to get a drinking water set-up and a garage set up for the vehicles to protect them from sun and rain. Camp Felis may have looked a little disorganized, hygiene but it was in fact very practically laid out. 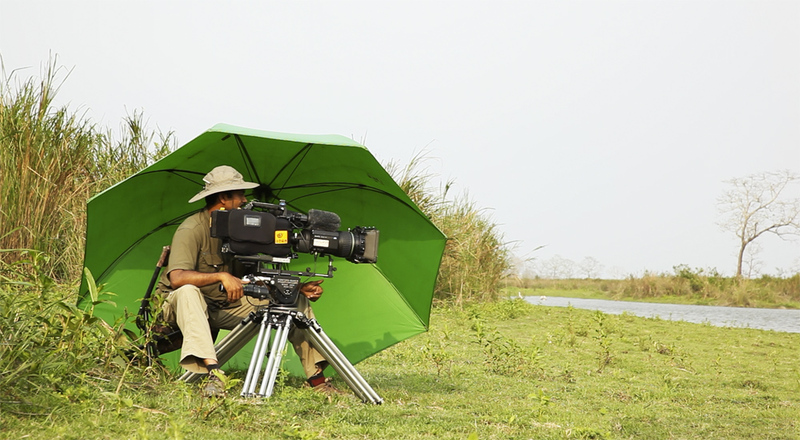 Kaziranga is an easy place to film wildlife. There’s always some wildlife or the other around. But what we needed were stories and in a place spread over 600 sq. kms. you are guaranteed never to be at the right spot at the right time. 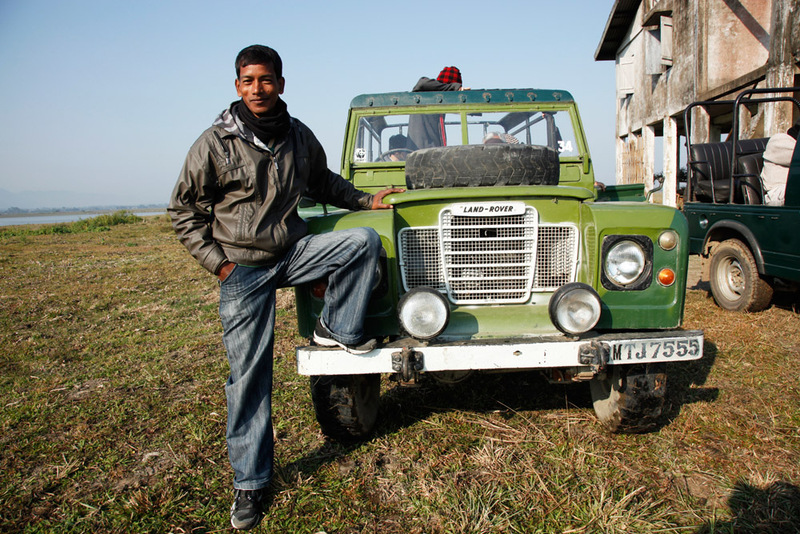 Enter – Karpagam Chelliah, a wildlife researcher studying elephants, Bhuvan the man with a Land Rover and a network of ALL the tourist gypsy drivers and finally the Kaziranga Forest Department staff – without whose active co-operation none of this would have been possible. Speaking of being at the right place at the right time – it’s not always possible and not as easy as it sounds. For example, the opening sequence of the film features a day old elephant calf, still pink, with large eyes and unsteady legs. I got a call from Karpagam who was in field, informing me of the elephant calf moments after it was born. I was far away in the city of Guwahati when this happened. 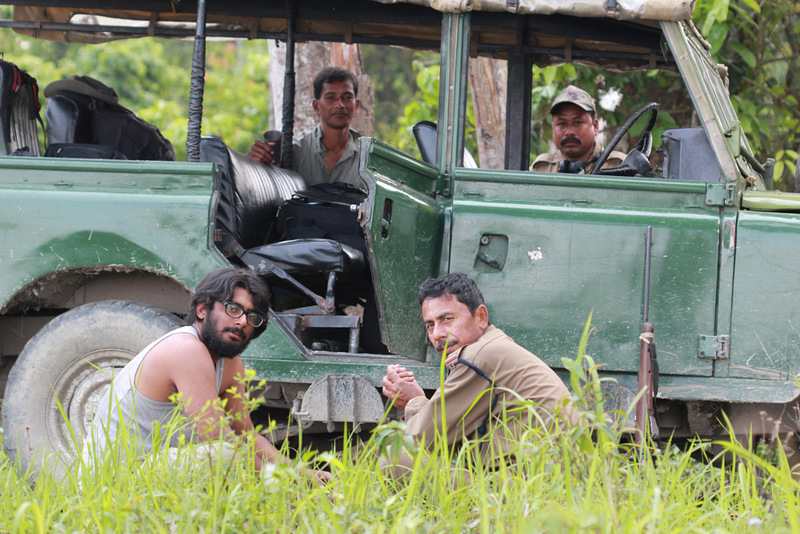 The moment I got the news I rushed back to Kaziranga and the following day we were able to track the herd and capture the sequence. So it’s important to have a large network of extra eyes and ears who can inform you of things as they unfold – otherwise it’s nearly impossible to get lucky enough to capture all aspects of an animals’ life history within a short period of time. By end February Sam Mansfield arrived with all the big toys. A massive HJ-40X lens matched with an equally massive Ronford-Baker tripod. The main camera for the shoot was my Panasonic HDX900. Apart from this we also shot with a Canon 5DMark2 and a 1DMark4. 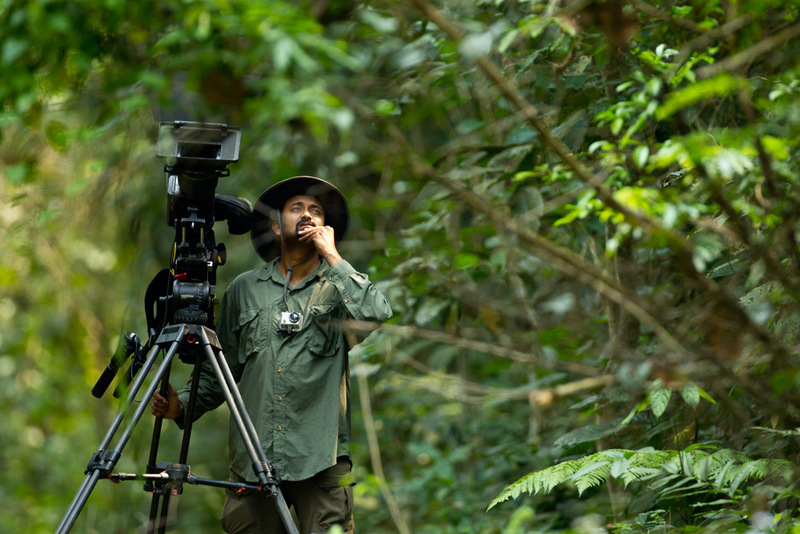 Although the 5DMark2 was mainly used for time-lapse we also shot a number of key sequences in the documentary. For example, the sequence of fig wasps was shot entirely with the Canon MP-E65mm 1-5X macro lens. It magnifies an image 5 times life size. For an animal the size of a fig wasp this was an essential piece of kit! 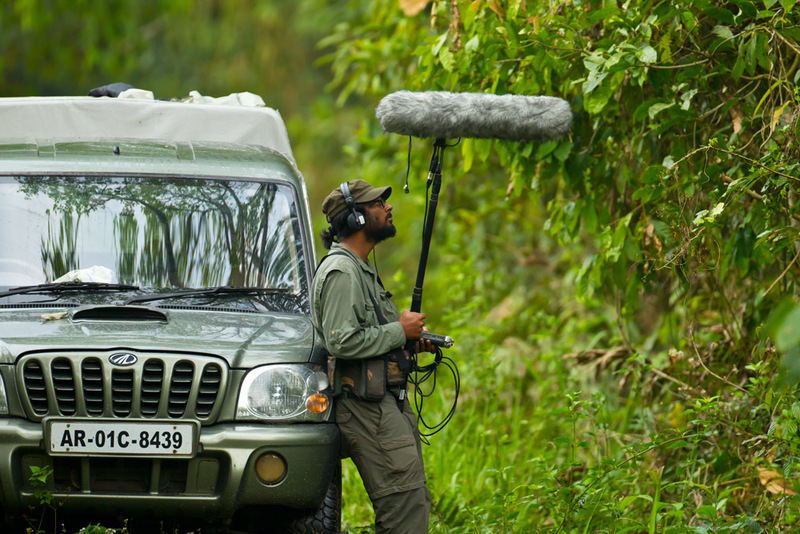 Chinmay Rane’s additional task was to gather as much natural sound as possible, especially of each landscape and individual animal sounds. Sound recording is a critically important part of the filmmaking process and often the one that’s most ignored. 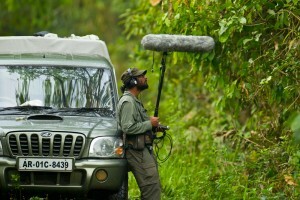 Here Chinmay and I are trying to record Hoolock Gibbons at Gibbon Wildlife Sanctuary. Apart from being the assistant producer of the show Sam’s role was to distract people away from the camera. With his exotic appearance he played this role remarkably well. 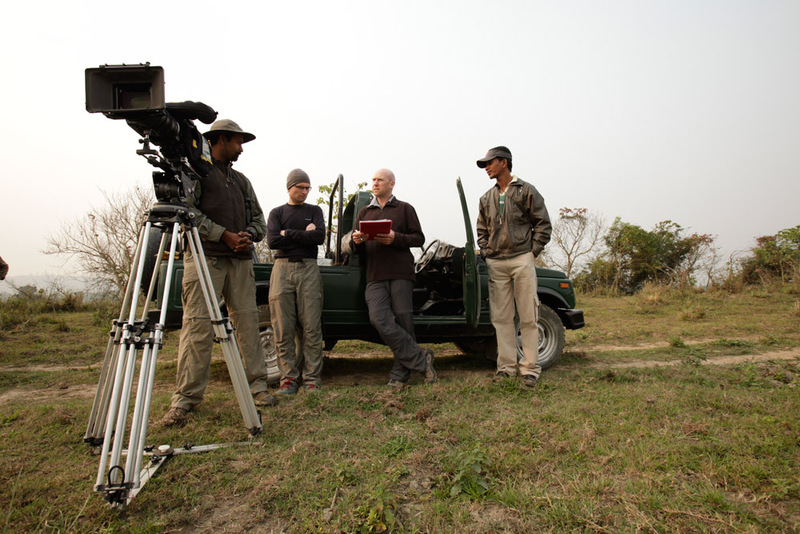 Next Duncan Chard – the series director arrived to take in a bit of Kaziranga and get a feel and direction for the film. At the end of each day’s filming we gathered not just to discuss the days events, but mostly to enjoy a chilled mug of beer and watch the Cricket World Cup that was going on during that time. Along with Duncan came Brendan McGinty – a London based cameraman with a passion for new technology. 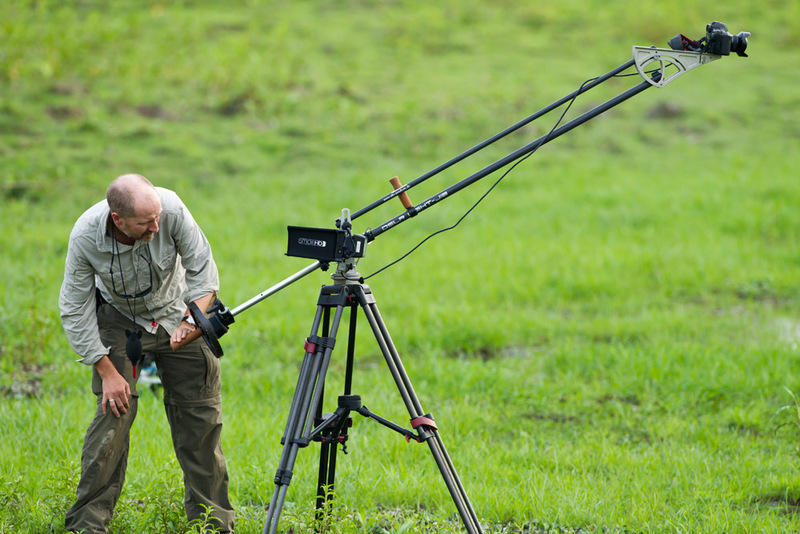 He brought with him a brand new ABC-DSLR Light Jib and two 5D Mark2 kits for shooting time-lapses. 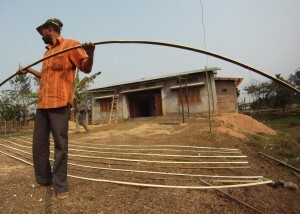 It was great fun working with Brendan who loves his camera toys as much as I do mine… He almost talked me into buying a Red Epic… but I put that on hold for now and instead got myself an ABC D-SLR Light Jib that I’ve now used on every shoot since Kaziranga. The magic ingredient at the end of the day boils down to teamwork. None of these projects can ever be made alone and the credit really goes to the fantastic team behind it. 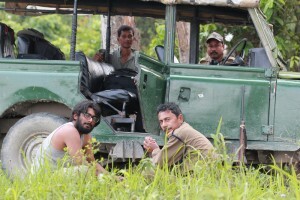 From the field side of things, I owe it to generous support from the Forest Department, Chinmay Rane – Assistant cameraman, Bhuvan – my field assistant and to Karpagam Chelliah. In post-production, series director Duncan Chard worked tirelessly with editor Glenn Rainton watching every frame of footage and tying things together. Also, credit goes to Harry Marshall who not only came up with the idea, but also brought in the real magic ingredient for the series – the timeless, epic voice of Sir David Attenborough. If you’d like to read about Tiger Jungles and Desert Lions – visit (Sara) Saravanakumar’s fantastic new blog. For television schedule, it’s best to look up National Geographic’s various websites in different countries. 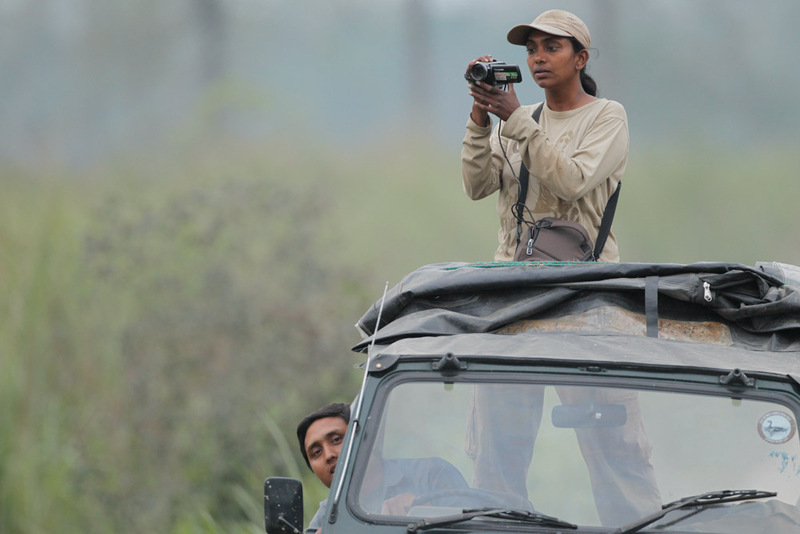 Last week the International Wildlife Film Festival announced the finalists awarding – Secrets of Wild India – Elephant Kingdom with the title – Best of Category – Television Series. To see further details about the rest of the series click here and to see the full list of Award winners at IWFF 2012 click here. 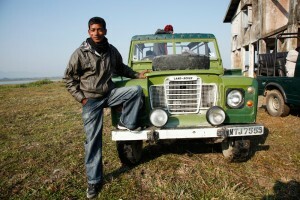 Kaziranga was the first place I went after landing in Delhi. What a wonderful place! Actually I fell in love with Africa as a nine year old but in 2001 I finally got to go to India and fell in love with it too. What a wondrous country. 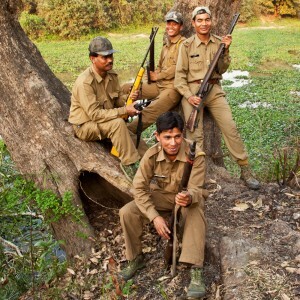 My first encounter with a wild tiger was on Feb 14, 2001 – Valentine’s Day in the USA – in Bandhavgarh. I really am looking forward to watching your program. Hi Debbie, hope you get to watch the program soon. It airs on National Geographic Wild Channel. 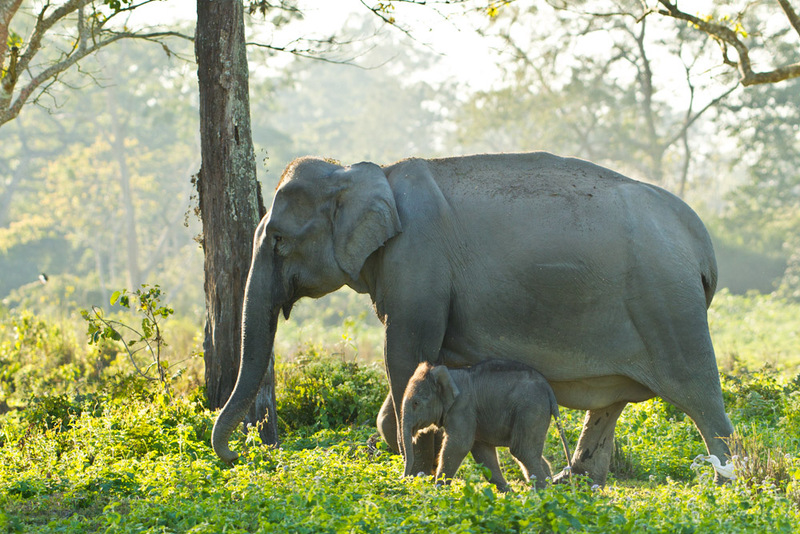 Kaziranga is no doubt a wonderful place! You are a great inspiration. CONGRATULATIONS for your achievements. I just saw this spot and that captivating pic of the elephant Mommy and her calf .I salute you and your team and would love to know where and when I can see more of your work. This is a worthy illustration for “INDIA SHINING” – both from the point of view of what treasures we have and also the sensitive and creative pack of youngsters like you who focus on the positive and win us international laurels ! Congratulations and good luck! Muchisimos Gracias Roy – Thank you Shailaja! congradulations Eashu,keep on doing the job,best is yet to come from you. For your information – Your show will start airing in California April 17, second episode April 24 and the third will be May 1st. Thanks for that information. Will be sure to let my family and friends along the west coast know about the schedule! Hats off to you for the work you are doing. Keep it coming. Its inspirational. Will this program be airing in India too? If yes, would you know when? Thanks! The show has already aired in India as of a month ago but from now on, it will be airing frequently on the NG wild Channel. 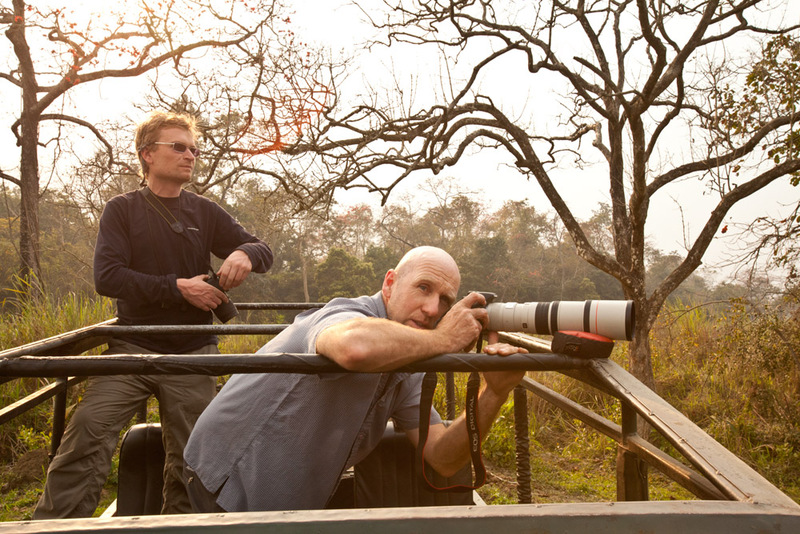 We won’t know when it’ll be airing next, but the best thing is to look at the TV schedule for NG India – http://natgeotv.com/in/secrets-of-wild-india There are ways that you can also set up an email reminder a day before the show and things like that… Cheers!